I wore my favorite fall cape on Monday to the Lela Rose runway show! I already adore this piece and know it will be a classic go-to in my closet, but I got so many compliments on it on Monday that I cherish it even more! While validation from others isn’t something I look for when I get dressed (I don’t give a you-know-what if someone doesn’t like my outfit – everyone is welcome to their own opinions), it’s always nice to hear positive remarks about an item you invested in. You’ve already seen the cape styled here and in today’s post as a fancier accessory, but what I’m really eager to wear it with is just a sleek pair of skinnies and pumps. A gorgeous fall look in my book! Speaking of jeans, I’ve picked up a few new pairs to take me right through to cooler temps – I purchased this pair of high-waisted coated skinnies, 7’s Slim Illusion skinny jeans and this pair of amazing flares. I’m still on the lookout for a cute clutch – anyone seen anything fabulous that I need to check out? A couple I’m eyeing include this beauty by Khirma Eliazov, this rockstud clutch, or this Balenciaga foldover (but with silver hardware). It’s also really hard to resist this copper-colored crocodile clutch. Try saying that five times fast! Gorgeous outfit. I’ve been all about capes recently, I feel like I should invest in one sooner rather than later! I love how you’ve styled it here, but agree that it would look perfect with skinnies! Can’t wait to see that! lovely! I love these photos…you look gorgeous as always and I love the look. This is one of my favorite color combos of all time. So classic. I love this color combo and that last pic of you is so pretty. This is my favorite color combo ever! I love the cape – if someone doesn’t like it, then they just don’t know fashion! You look beautiful! I love your cape! It so elegant and stylish! You’re just killin’ it in New York! I love the idea of a fringed clutch! I think Prada, Miu Miu, and definitely Proenza Schouler have some! I think you might know how I feel about capes, love them! This color combination works so well, and it is a bit too chilly here in NYC so it is the perfect item to cover up with! This look is so elegant! I wish I had the height to wear a cape like that. It’s gorgeous! 1. Shirelle did an AWESOME job with these photos! 2. You’re such a fashion plate! Love it! Classic! That cape and those booties are just too good together! Love it! What a great outfit Merritt, I love the classic colors of white, than and black. That cape is fabulous, no surprise that you got compliments while wearing it. I am the same as you, I dont dress in a way to please others, but it always is a fun little boost of confidence when you get sweet comments on the outfit you are wearing. I’ll take your photos anytime! You are so freakin chic. LOVE!! You’re so adorable! And that cape gets me every time…tres chic! I LOVE this look on you! I hope Fashion Week has been a blast, I’ve definitely been following along on insta! Wish I was there with Ellen! Such a fabulous and classy look!! LOVE this cape and color. So chic, Merritt! I have a feeling capes are going to be big this year. this outfit is super fab!!!!!!! i love the skirt and coat and bag!! So classically beautiful! 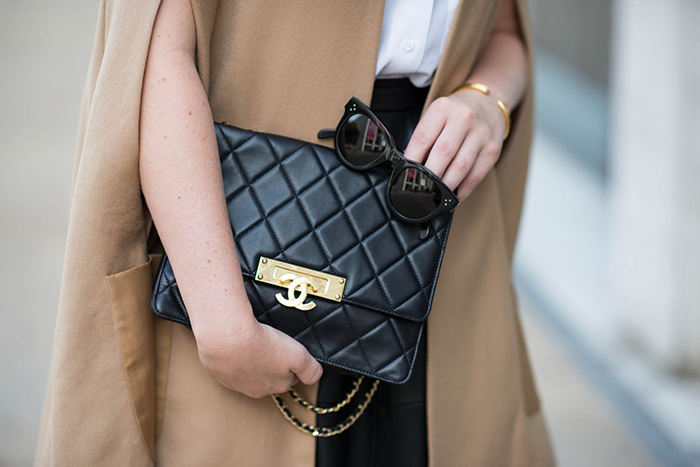 You can never go wrong with this timeless and versatile cape. I love how you styled it here with this flattering midi skirt and edgy heels! Love the cape! So fabulous. And it looks fantastic with the leather skirt! Love that cape! Perfect for NYC! Loving this color combo, so classic! Sooo pretty,Merritt! I love the last photo. As elegant as always! Love the last pic and your funny smile!